A “Palestinian Authority Spring” appears to be limping, but getting off the ground in Ramallah against Fayyad and Abbas. Hamas is waiting. 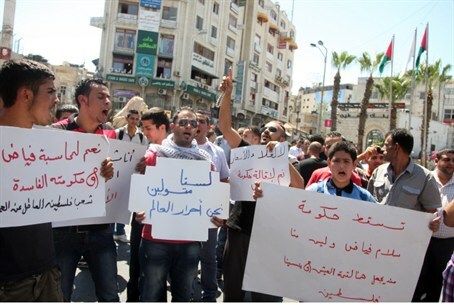 A belated “Palestinian Authority Spring” appears to be limping, but getting off the ground in Ramallah. Dozens of PA Arab truck drivers and quarry workers protested in the city where the Fatah-run government controls the remaining PA-controlled areas of Samaria and Judea. On Sunday, main streets in the PA capital were blocked by the dozens of Arab truck drivers demonstrating against the climbing prices. Not far away, a few dozen quarry workers were doing the same. More than 150,000 government workers have not received their salaries this month. PA Prime Minister Salam Fayyad announced Thursday he is willing to resign if that is the “will of the people,” but, as usual, blamed Israel for the Palestinian Authority's financial troubles. Western mainstream media have long touted Fayyad as an economic wonder worker, but that has not panned out for the man in the street and the PA is bankrupt, owes the Israel Electric Company 700 million shekels. A number of foreign donors who have promised aid have not yet made good on their pledges, particularly a number of those from the Arab world. Of those who have, some have withheld a portion of what was promised. In the case of the United States, some of the delay may be connected with the fact that the PA does not always use the funds granted for the intended projects. Moreover, a significant percentage of the PA budget is drained by the monthly “salaries” paid to reward terrorist inmates detained in Israeli prisons, rather than used to create new national infrastructure, improve schools and so on. In fact, the PA this month granted a “pay hike “ to those who murdered Israelis, spending about six percent of its annual budget – $4.5 million per month – and another $6.5 million to their families, according to a report broadcast earlier this month of Israel's Channel 2 television. The monthly salaries total NIS 12,000 (approx. $3,000) for anyone who has served more than 30 years in jail for murdering Israelis. They are even higher for those with Israeli citizenship, according to the report. The average wage earner working in the PA brings home only some NIS 2,000 (approx. $500) per month. The PA has opposed and significantly cut the ability of workers to earn a living in Israeli-controlled areas, already reduced due to terror acts, adding to unemployment. Gaza, once considered the third part of the PA, has since broken away and come under the rule of Fatah's rival, the Hamas terrorist organization. Recently there have been reports that Hamas is considering declaring its own state altogether, but none have been confirmed. Fayyad and Abbas fear a Hamas takeover in the rest of the PA.